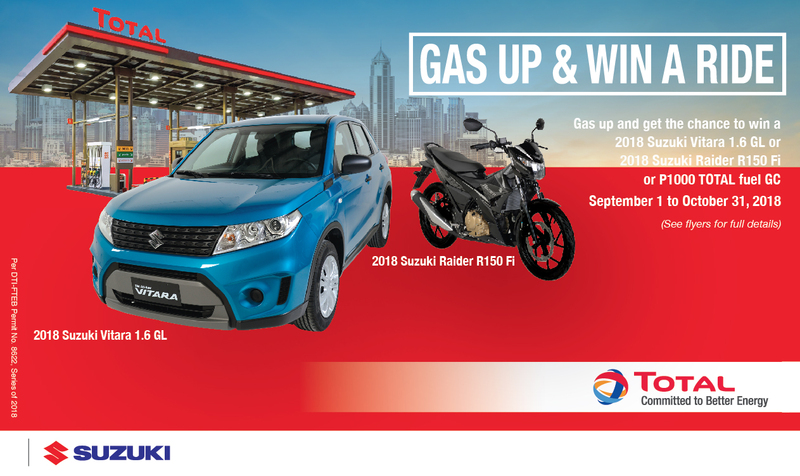 Gas up at Total and get a chance to win a Suzuki Vitara or Suzuki Raider R150. As the ‘ber’ months roll in, the Philippines is once again ready for one of the longest Christmas celebrations in the world. Total (Philippines) Corporation and Suzuki Philippines are one in sharing the excitement of Filipinos during this giving season, and have teamed up in giving customers an early Christmas experience. Through the “Gas Up and Win a Ride!” promo, loyal patrons can get a chance to drive home one of six 2018 Suzuki Raider R150 Fi and one of two brand new 2018 Suzuki Vitara 1.6 GL SUV, starting this September 1. “Total is one with Suzuki Philippines in celebrating one of the happiest seasons of the year. As partners for five years, we want to continuously extend our appreciation to our loyal customers. We are jumpstarting this year’s seasonal celebrations with our newest promo,” says Raymond Decena, Total Philippines Vice President for Retail. Running until October 31, every P1,000 single or accumulated purchase of Total Premiere or Total Diesel fuels earn customers one (1) raffle entry for the grand draw in November 14. Total Excellium customers can double their chances of winning as they get two raffle entries for every P1,000 purchase. Total App users can simply present their apps to the station attendants and earn an additional entry for even more chances of winning.